BPI's is adjustable to terminate 22-26 gauge wire on 110 and 66 termination blocks. The adjustable settings allows for quick punch down termination on various terminal block types while the blade cuts off excess wire in one easy step. BPI's modular crimper has ratchet action to make crimping modular plugs in the field a simple process. The tool can also be used for cutting and stripping of wire. 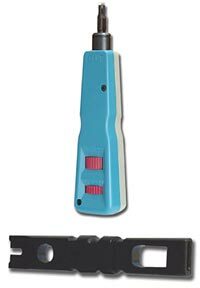 This versatile crimper can be used on RJ11, RJ12, and RJ45 modular plugs which can accommodate up to eight wires. BPI's Unshielded Twisted Pair "UTP" stripper prepares twisted pair cable for termination. It easily removes the outer cable jacket without damaging the inner twisted pair conductor wire. This crimper tool has parallel crimping action to make secure splices utilizing the UY2 and UR2 connectors. 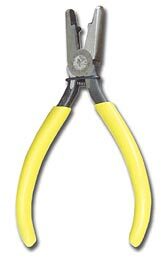 The return spring and vinyl handle cover make splices easy and strong. The tool can also be used to cut wire.